The Motorola TLKR T61 is a durable and stylish set of two-way radios using the license-free PMR446 broadcasting range. Exceptionally easy to use, the Motorola TLKR T61 features an LCD screen for displaying important information such as channel selection and battery life. 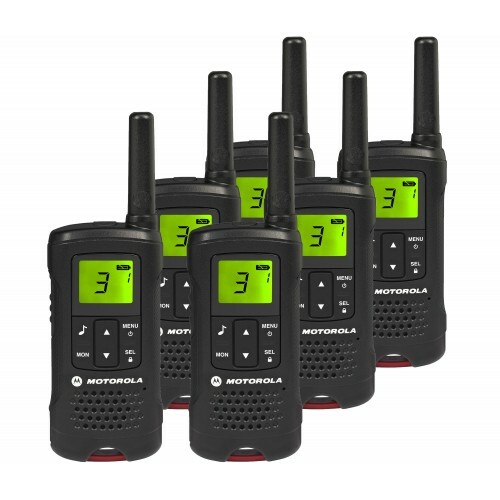 There are five call tones to choose from, and the radios allow you to choose from up to 8 channels and 121 codes. Belt clips, rechargeable batteries and charger pods are also included. The Motorola TLKR T61 radios are ideal for those requiring a reliable way to stay in touch during their outdoor adventures.